This is a work-in-progress news aggregator site for news lovers. 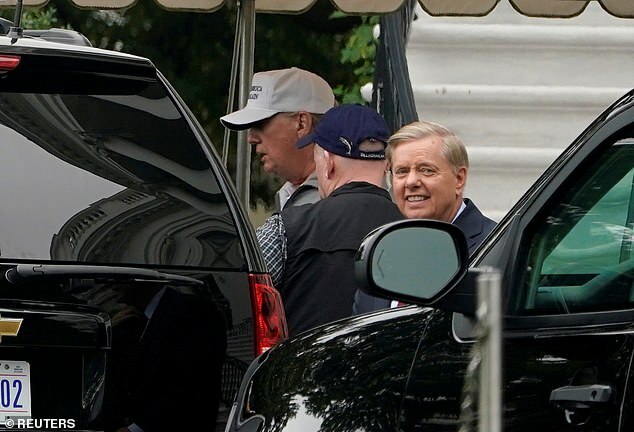 Sen. Lindsey Graham, who was a fierce and fiery defender of Brett Kavanaugh during his confirmation process, is celebrating his elevation to the Supreme Court by playing golf with President Donald Trump on Sunday. 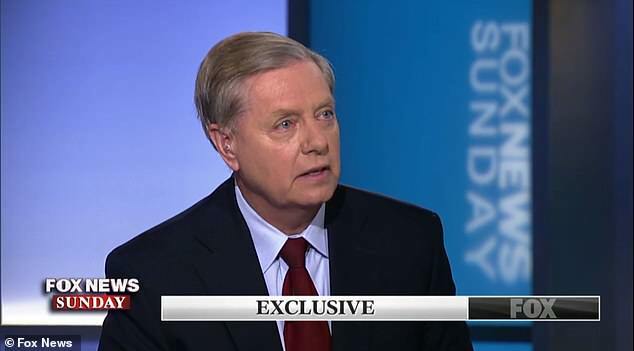 Graham confirmed his plans in an interview with ‘Fox News Sunday,’ where he also warned Democratic senators he would be coming after them this November. ‘I’ve never campaigned against a colleague in my life. That’s about to change,’ Graham said. 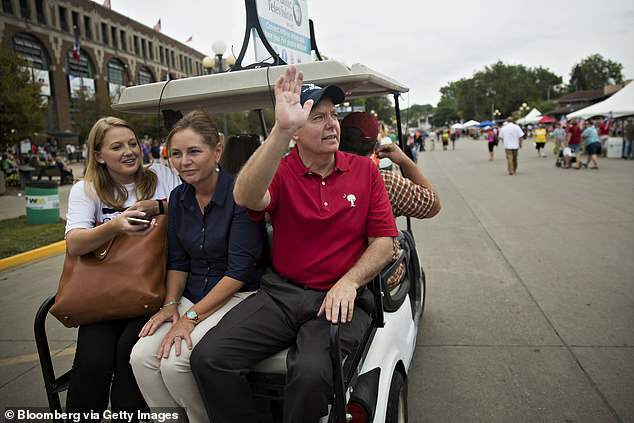 ‘I’m going to go throughout this country to let people in these purple states, red states were Trump won know what I thought, know what I think about this process,’ he added. He didn’t detail which Democrats will be in his sights. 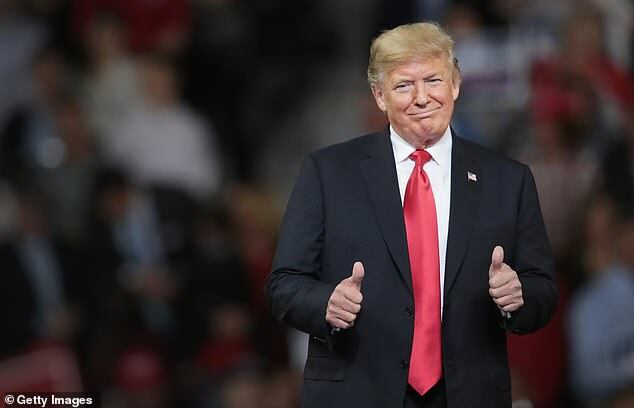 But several Democratic senators who voted ‘no’ on Kavanaugh are running for re-election this year in states Trump carried in 2016, including Jon Tester of Montana, Claire McCaskill of Missouri, Joe Donnelly of Indiana, Bill Nelson of Florida, and Heidi Heitkamp of North Dakota. The Kavanaugh confirmation process is expected to be a factor in the upcoming midterm election, rallying both sides of the aisle: Democrats furious at his confirmation and Republicans furious at his treatment. Graham, who made headlines for coming to Kavanaugh’s defense during his testimony before the Senate Judiciary Committee, said he is still angry over the way the Supreme Court nominee was treated. ‘I had never been more pissed in my life,’ he said. 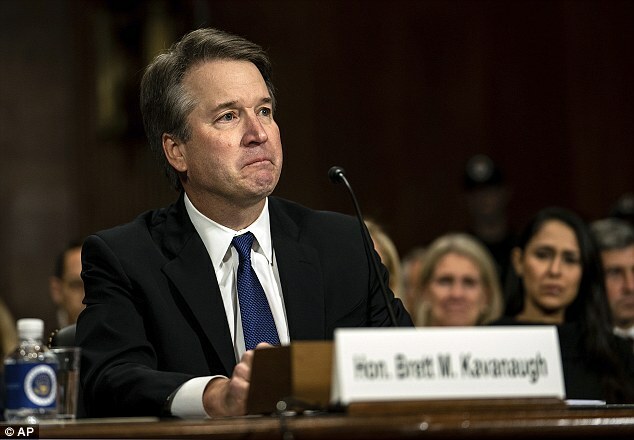 Kavanaugh was confirmed to the Supreme Court by a 50-48 vote on Saturday after his confirmation was put in jeopardy from sexual assault allegations from multiple women, all of which he denied. Every Democrat except Sen. Joe Manchin voted against Kavanaugh while every Republican – except Sen. Lisa Murkowski – was a yes. 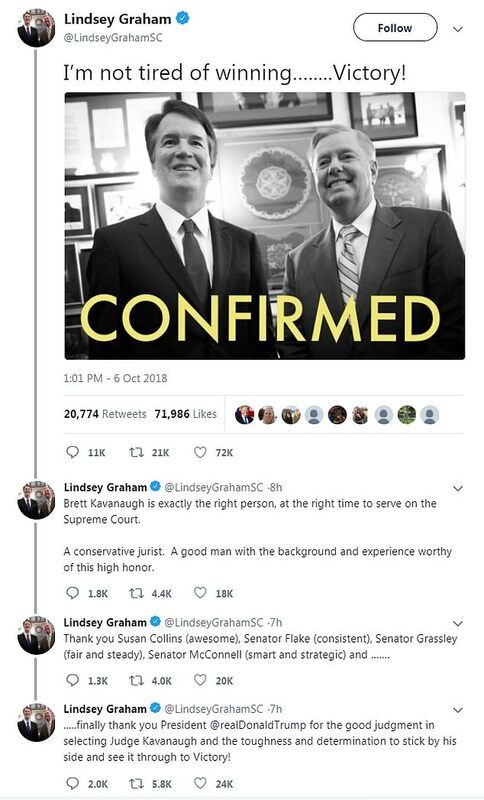 Graham said he was as ‘happy as a clam’ Kavanaugh was confirmed. Kavanaugh, who is replacing swing vote Justice Anthony Kennedy, is expected to shift the high court to a more conservative stance. 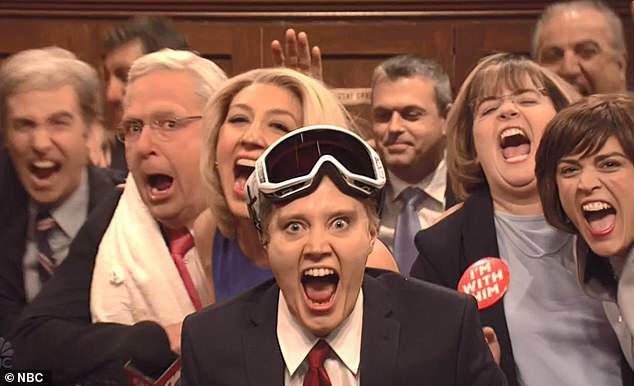 Graham’s profile was raised in the wake of his Kavanaugh defense, where the South Carolina senator was harassed by protestors in the Capitol and mocked on ‘Saturday Night Live,’ where he was portrayed by Kate McKinnon. 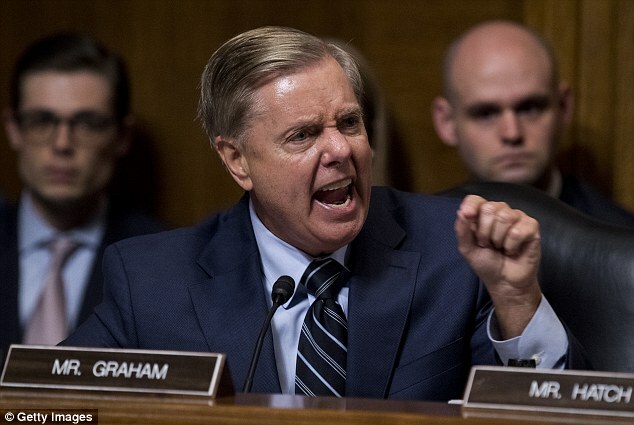 Graham’s outburst during Kavanaugh’s testimony was an instant viral moment for conservatives and turned the Republican tide back toward the nominee after Christine Blasey Ford’s emotional testimony on her claim Kavanaugh attacked her during a high school party in the 1980s. 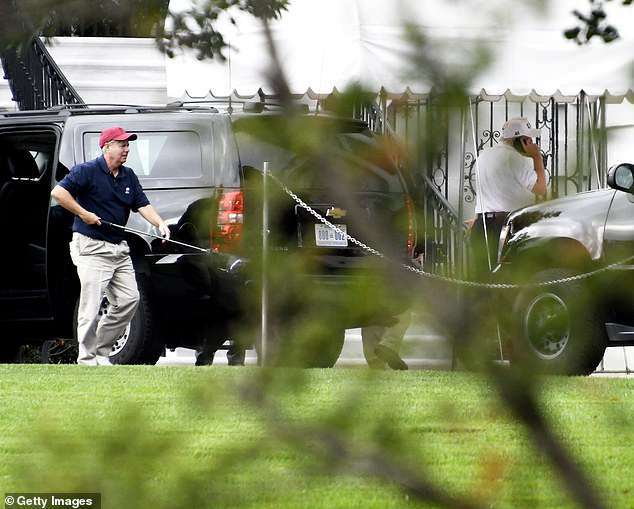 Sen. Lindsey Graham (R-SC), left, carries one of his golf clubs as he leaves the presidential limo at the White House on October 14, 2017 in Washington, DC. President Donald Trump is seen at right talking on the phone. He also charged Democrats with playing politics with Kavanaugh’s career in the hopes of winning control of the Senate in the 2018 midterms and then winning the 2020 presidential election for their party. ‘What you want to do is destroy this guy’s life, hold this seat hope and hope you win in 2020. You’ve said that,’ he yelled.